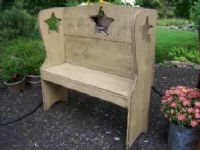 This is a one of a kind white rough wood bench. It has star cut outs on the back and both sides. It measures approx. 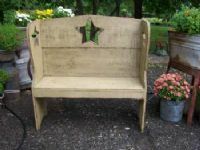 36"long by 35.5"tall by 12"deep (measurements on outer edge) the seat measures about 11" by 34.5"